An article published in the journal “Monthly Notices of the Royal Astronomical Society” describes the study of molecular clouds where new star clusters form. 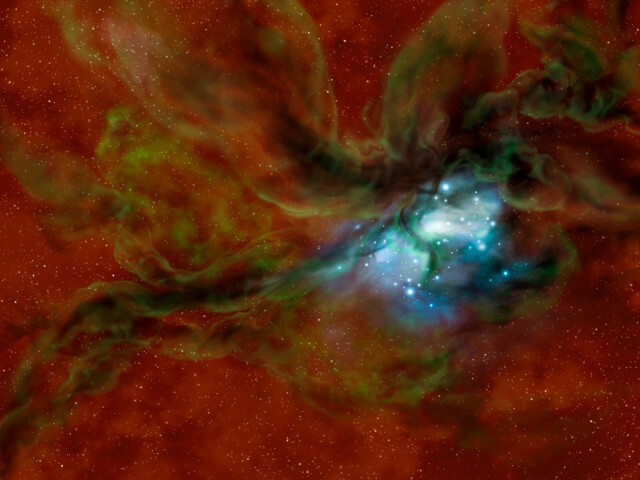 A team of researchers used the SOFIA airborne telescope exploiting its ability to detect infrareds coming from dark clouds where the first stages of star formation are hidden. The observations offered new evidence that star clusters form as a result of collisions between giant molecular clouds. In recent years many studies have been conducted of newborn stars and stars that are still in their formation phase but it’s difficult to observe the very first phases of that process because it takes place inside molecular clouds full of gas and dust that block many electromagnetic frequencies. The consequence is that astronomers must use specific instruments that can detect the frequencies that can escape from those clouds such as infrareds. The SOFIA (Stratospheric Observatory for Infrared Astronomy) airborne telescope is a project of NASA and DLR, the German space agency, that uses a Boeing 747SP modified to allow the use of a telescope of 2.5 meters in diameter. It specializes in infrared astronomy thanks to the fact that at the altitudes at which flies, between 12 and 14 km (39,000 to 45,000 feet), there is much less water vapor to absorb that kind of light. Thanks to this ability of the SOFIA airborne telescope, it was possible to study a dark molecular cloud, precisely the type dense enough to block many frequencies but visible at infrareds. Cataloged as G035.39-00.33, it was already the subject of previous studies to try to examine the star formation inside it, where protostars were found in large amounts suggesting that there’s a burst of that process. It’s therefore an excellent subject of study to try to understand the mechanisms that can lead to the birth of star clusters. In particular, the researchers used the SOFIA airborne telescope’s GREAT (German Receiver at Terahertz Frequencies) spectrometer, finding what appear to be two distinct molecular components that are colliding with each other at speeds approaching 40,000 km/h (more than 20,000 mph). The distribution and velocity of molecular and ionized gases are consistent with cloud collision simulations, indicating that star clusters form when gas is compressed into the shock wave created by that type of collision. The image (NASA/SOFIA/Lynette Cook) illustrates molecular clouds surrounded by atomic envelopes (in green) that were detected by SOFIA thanks to emissions from ionized carbon. The offset and movements in space confirm the predictions of simulations of molecular clouds collisions. These are important observations to reveal the mysteries of the beginning of star formation since there’s still no certainty on this subject. Professor Jonathan Tan of Chalmers University of Technology in Gothenburg, Sweden, and the University of Virginia, USA, one of the lead authors of the research, stressed the fact that the data his team is getting with the SOFIA airborne telescope can really test the simulations. They confirm molecular cloud collision model but Professor Tan explained that the next step is to use SOFIA to observe a greater number of molecular clouds in which star clusters are forming in order to understand how common the collisions are in triggering star formation. That’s because it’s essential to have further confirmation or evidence that other mechanisms exist that trigger star formation.